Linden Malegarde has returned home to Paris from the United States where he lives with his partner. It has been years since his family was all together. They have reunited for the patriarch's birthday; Paul is celebrating a milestone and is turning 70. The City of Lights is on the verge of a natural disaster when the Seine bursts and it floods the city. Paris is as fragile as the Malegarde family's relationships—each member is trying to balance the delicate family dynamics. Paul is a world-renowned arborist that only seems to have eyes for his grove of trees. Lauren is his American wife who is determined to make the weekend a success. Tilia, the blunt oldest child has an 18-year-old daughter Mistral who is adored by her uncle Linden. Colin is Tilia's much older spouse, an elegant British art dealer that can no longer hid his drinking problem. And that leaves Linden. He has never been comfortable in his own skin and never feels settled having grown up as an American in France, and a Frenchman in the US. His relationship with his father has always been off. Even though he is a successful and in demand photographer, he feels that he will always be a disappointment to his parents. Bound by tragic events, the family must fight to remain united as secrets unfold and their greatest fears surface. 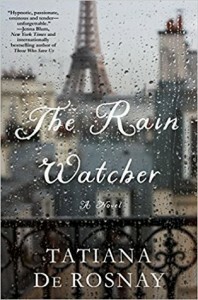 Set in Paris during a rainstorm, this gorgeous, haunting work was captivating from start to finish. de Rosnay's writing is elegant, hypnotic, and incredibly moving. The story is profound and intense, yet soft and beautiful. I devoured this book in one sitting and would highly recommend.